Filled with owl box success stories, owl conservation, school owl programmes and a hint at Christmas. We hope you love it! We often see that many of our newsletters go un-opened. 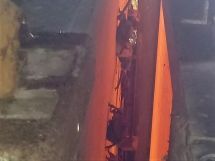 This may be a firewall or some other technical aberration. If you enjoy these updates, please add the info@ecosolutions.co.za address into your contact list to make sure that you don't miss out on any of our awesome stories and news. You can also update your details on the link provided. Six years after installing his owl box, our client in Oakdene received the surprise of his life when he and his gardener checked on the box... and an adult owl flew out! Oakdene welcomed three Spotted Eagle Owlets (Bubo africanus) in September. 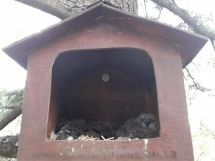 A team from EcoSolutions placed rings on the owlets. Please welcome Owlet 864936, Owlet 864937 and Owlet 864938. Click here for the full story, pictures and videos of these three owlets. Please remember it is important to have your owl box serviced annually - book your owl box service here. 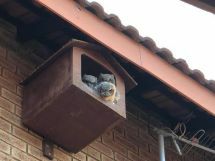 The Gleneagles Owl Box has become a well-known success story, especially to the residents of Greenside and the surrounding suburbs. The story first began after a heavy storm in October 2016 (click here to refresh your memory) and it continues today. After checking the owl box regularly, with no signs of owlets, the owlets suddenly made their appearance and poked their heads out of the box. We invited the community and residents of Greenside who came to help us ring the owlets. Please welcome Owlet 887921, Owlet 887922 and Owlet 887923. Click here for the post on our Facebook page. "Good morning Sara, A HUGE thank you to Sara and her team from EcoSolutions for the great service of our owl boxes and for yet another successful ringing of the owlets that have given us such pleasure annually over many years. It’s a real privilege being part of EcoSolution’s owl box project. Ron, Phyllis and Andrew Lapin"
Phyllis has had her owl box serviced and occupied for the last 6 years! Please welcome Owlet 887928, Owlet 887929 and Owlet 887930 to the Bryanston Community. Click here to watch the video on our Facebook page. 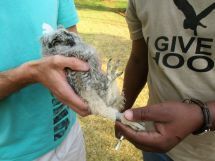 A pair of Spotted Eagle Owls (Bubo africanus) returned again this year to breed in their 'usual' owl box in Robindale. We checked on the owl box in September and found three owlets. The owlets were too young to ring at that stage, so we returned a month later and, joined by fellow ringers, ringed the owlets. Please welcome the new residents of Robindale, Owlet 887925, Owlet 887926 and Owlet 887927. To find out more about these owlets, please click on the link. After meeting a SAPRA representative at the Spring Day market at Hugh Wyndham Park in Dunkeld (hopefully, the first of many more morning markets), we arranged to have an owl box installed at the local park in Parkwood. 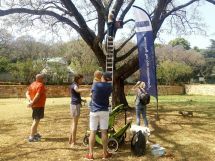 The Spotted Eagle owl box was installed early on a Saturday morning to allow the early bird fitness fanatics to be there. In addition, an educational signboard was installed for visitors to read up about the Owl Box Project. Please follow the link for the full story. NATIONAL OWL BOX DATABASE - JOIN UP! We are appealing to anyone with an owl box, occupied, unoccupied, whether it be an EcoSolutions Urban Ecology owl box, a homemade owl box or an owl box purchased elsewhere to join the NATIONAL OWL BOX DATABASE by following this link. Citizen science is an essential tool in our efforts to understand and conserve owl populations in Southern Africa. We need your help. Please share this with your friends or anyone you know who has an owl box installed. Here is an interesting fact about owls to impress your friends and family members at your next gathering or braai! Click on the link to find out about Barn Owls (Tyto alba) unique hearing capabilities. 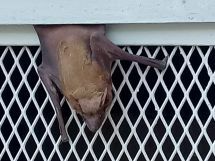 At EcoSolutions, we always insist on the best ethical practices in everything we do and thus we were delighted when the Sheraton Hotel in Djibouti reached out to us for an ecologically-friendly solution to their bat problem. The harsh climate did little to dampen the spirits of our team as they set out to exclude over 300 Naked-Rumped Tomb Bats (Taphozous nudiventris) from the hotel. Additionally, a number of alternative roosting sites, EcoSolutions bat houses, were provided for bats. We are very proud of our international contributions to bat-friendly practices and we commend the Sheraton Hotel Djibouti for joining the ranks of environmentally-conscientious businesses. EcoSolutions is the only permitted bat exclusion company in South Africa. Owlproject.org is having another busy year conducting educational programmes at schools throughout South Africa. 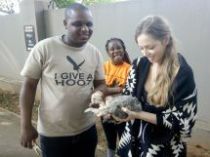 Delina, the coordinator of the NPO, has released Barn Owls (Tyto alba) and given educational talks on owls and their importance in our environment to kids from the Kliptown Youth Programme (KYP) in Soweto, Phelang Lsen School in Hammerskraal with EWT, Carter Primary School in Alexandra Township and the Sandton SPCA - just to name a few. Please click on the links above to read the full stories! 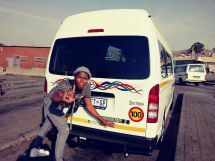 Owlproject.org was amazed at the willingness of taxi drivers to place our "owls eat rats" stickers onto their vehicles. Please click here to find out about this exciting Campaign! 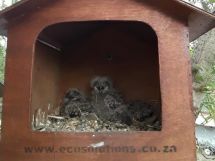 When Owlproject.org responds to calls received from residents in townships who have owls in their ceiling, they not only sit down and talk to the residents and their families about owls and their environmental value, they also install an owl box at their home and simply places the owlets in the owl box. No removal or "owl rescue" required. Since 2016, the annual highlight for owlproject.org is the BirdLife SA Bird Fair. At this year's Bird Fair, held at Walter Sisulu Botanical Gardens, we displayed nearly 2 000 pieces of artwork! This artwork is beautiful and has been created by school children from Alexandra Township as part of the annual Alex Owl Day. 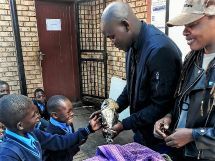 The Alex Owl Day is a much anticipated day for children in Alexandra Township and this year the idea of owl masks was theirs. Owlproject.org would like to thank Birdlife SA for their continued support of our project. Please follow the link to the story and more pictures of their art! Owlproject.org is close to our hearts and we support them where ever we can. We donate owl boxes, vehicles and our staff members to assist with owl calls, artwork projects and owl box installations. However, we can always use your help. Please follow the link to assist. 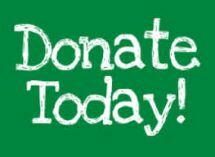 Even a small monthly donation helps owlproject.org keep on doing their amazing work. Lastly, but certainly not least, as we were trying to keep this newsletter short but interesting... Christmas. In 2017, there was such a mad rush for our Junior Scientists Kits that we weren't able to meet the demand! The Junior Scientists kits make great stocking fillers for kids between the ages of 7 and 14. The kits will also give you a few hours of peace and quiet while the kids and grandkids find and identify the bones in their owl pellet dissection kit. You can place your order here now! That is it for now from your EcoSolutions team. To sign up to receive our newsletters, please click here.